If you are particularly savvy concerning what documents you can use for your work, then you may have had cause to use sample calendar templates in the past. This is only to be expected nowadays, considering that it is possible to use calendars for various purposes, such as reminding you of different events like birthdays. As there are a number of different purposes for calendars, it follows that there are also a number of different templates available to you such as calendar templates in Excel. This makes it easy to make your calendars as specific as possible. This is especially useful in the case of birthday calendar templates since you are generally free to customize your calendars however you like. Since calendars can generally take different forms, it is possible to use various calendar templates in order to design your calendars however you want them. Thanks to different basic calendar templates, it is a fairly easy task to find alternate formats for your own calendars. This may allow you some measure of flexibility since your calendar can have a format more conducive to whatever intentions behind it. 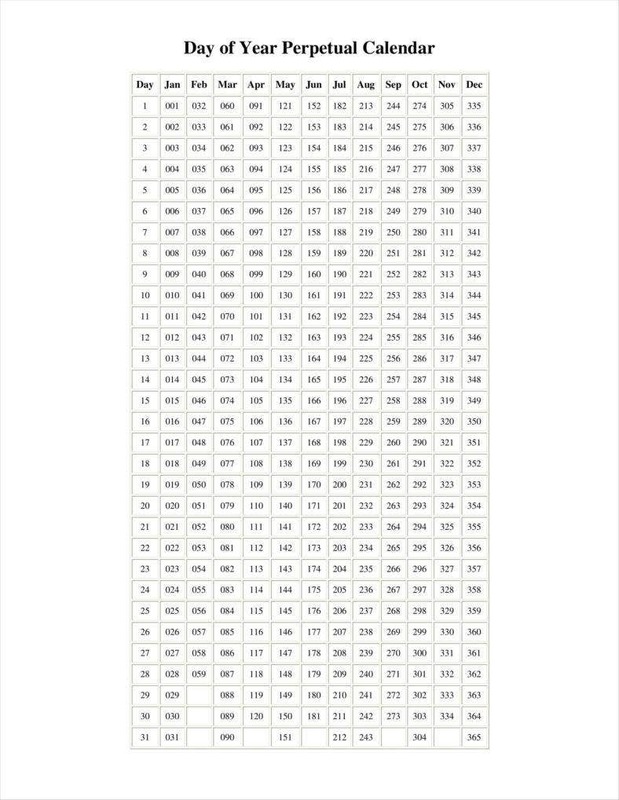 In this case, this would be a useful template to use if you had many birthdays to remember throughout the year. 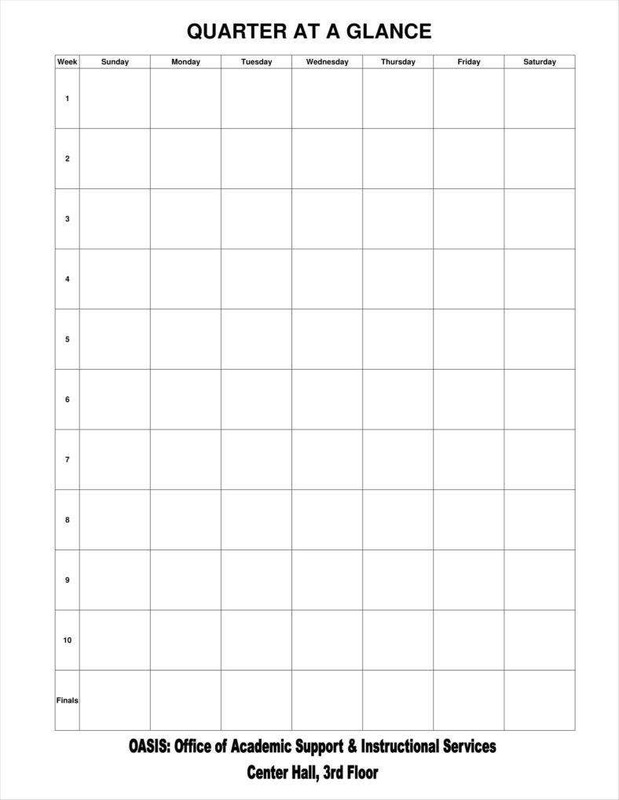 This type of template would make it easier to record birthdays scattered across a year, particularly if you have many dates to keep in mind or if the dates are specifically separated from one another. 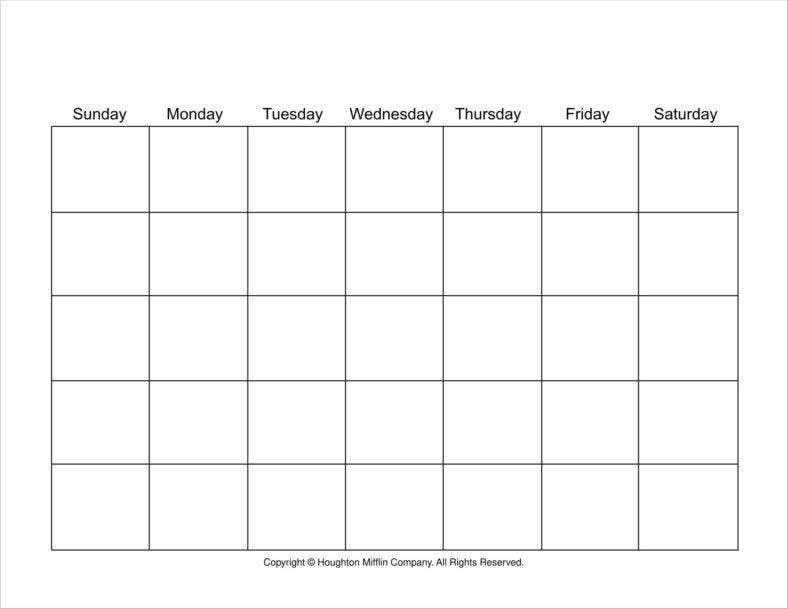 Another kind of template you may want to use is the quarterly calendar template. 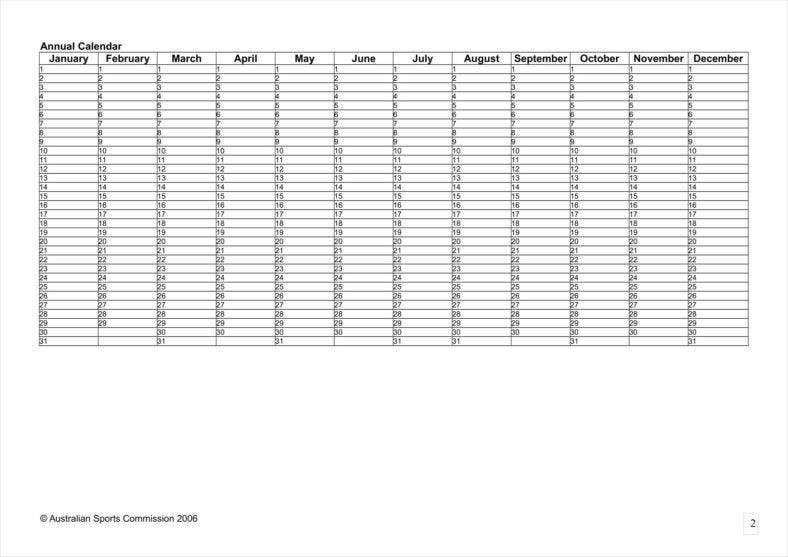 Rather than present you with dates for an entire year, this kind of template allows you to record dates for different quarters of the year, as may be the case with academic or business calendars. This can benefit you in listing birthdays if relevant birthdays happen to be clustered within the same general collection of months. As a matter of fact, if you have an especially large number of dates to remember, this can be a better choice than an annual calendar. This is because you can keep your perspective on a particular segment of the year and keep from being overwhelmed by the sheer number of dates. One alternative to annual calendar templates is perpetual calendar templates. 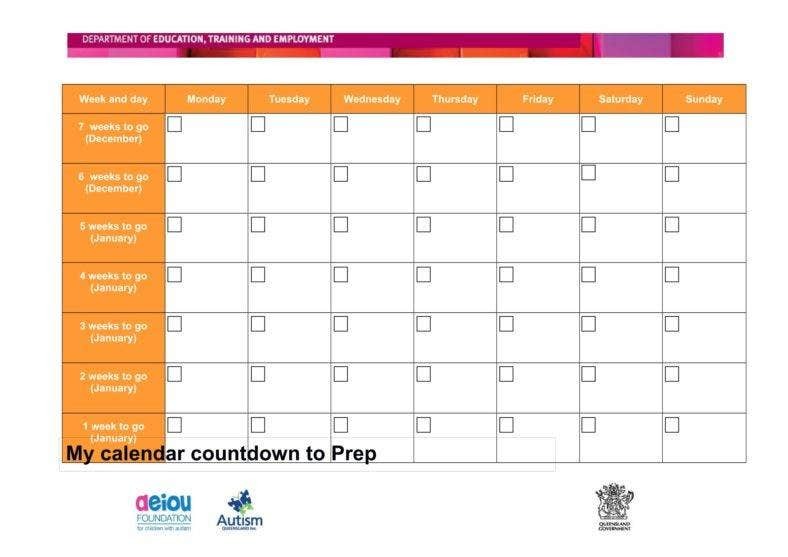 These calendar templates can be used if you need to make predictions well in advance of the dates in question, such as if you have plans years ahead. 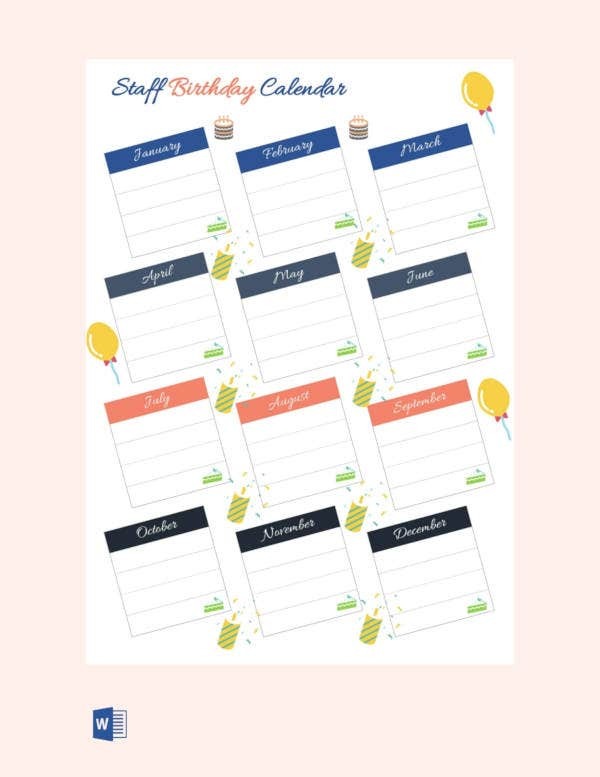 If your plans require that particular days for birthdays and their celebrations fall on specific days, then you can use these templates to calculate when those days will occur. This can give you significant amounts of time to prepare, particularly if you have an extravagant sort of celebration planned, as might be the case, especially for significant ones. Since birthday calendars are meant for festive occasions, this gives you more leeway with regard to their design compared to more professional calendars. 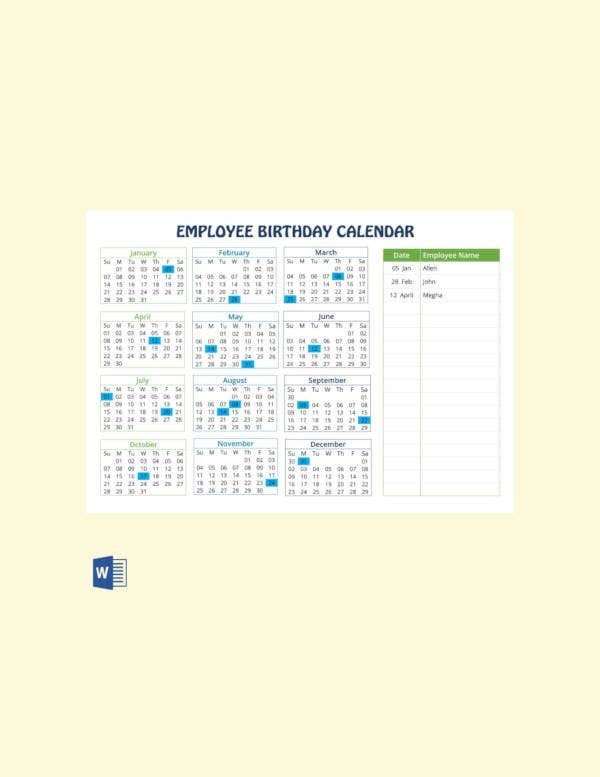 This means that photo calendar templates are a valid option for your birthday calendars. In this case, it would be more than possible for you to insert photos of birthday celebrants on your calendars. This can lend your calendars a more festive air, particularly if yours are more personal calendars. Of course, this also makes it possible to more strongly associate the birthdays in question with their celebrants, as you have the ability to include the celebrants’ photos on the relevant months. This may also be an option if you have a photo studio, as this provides you with a wider selection for your clients if they have specific orders for their calendars. In the case of family birthdays, you may find and use family calendar samples in order to make your calendars more personalized for yourself. After all, this allows you to include family members’ photos and personalized details for their birthdays, which naturally allows you to create very unique calendars meant only for yourselves. This should be appealing if you have a great desire to personalize your calendars for one reason or another. 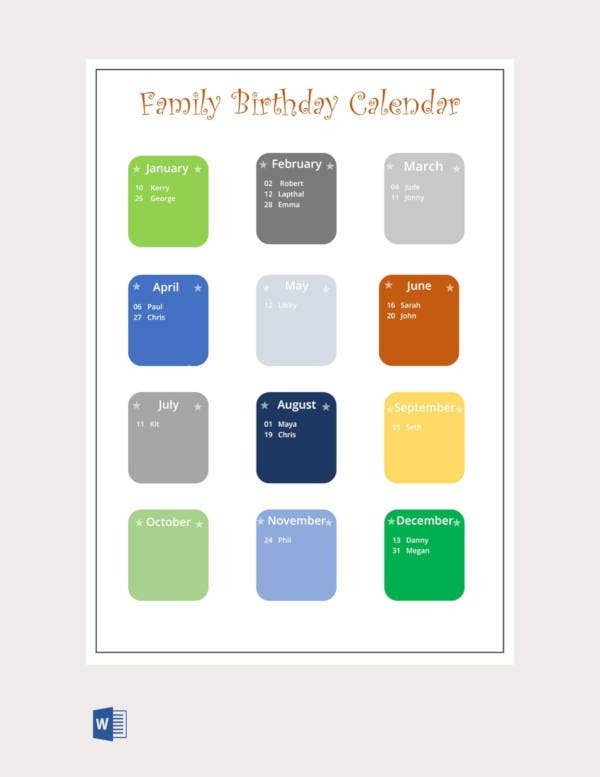 Of course, this would be an especially focused calendar, being that it would be primarily concerned with family members, but if you wanted to segregate birthdays or you had a particular need to focus on family birthdays, then this would be a perfect choice. 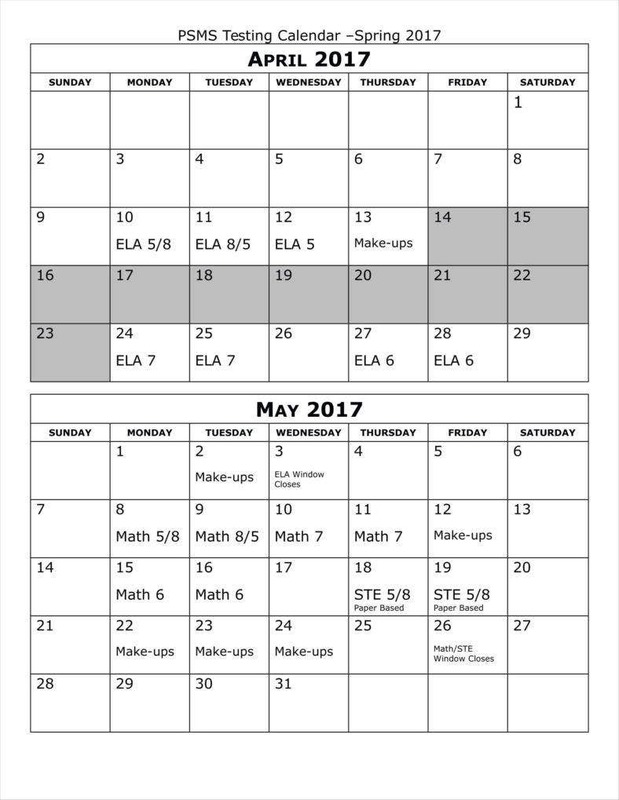 If need be, you may also printable birthday calendar templates if you saw the need to make your eventual calendars into printouts. Printing your calendars would always be a viable option, especially if you needed a more powerful reminder of the dates. After all, printing out calendars can serve to make them more prominent, and so makes it easier to keep them in mind. This could also be true of calendars for distribution, such as if you wanted to share birthday calendars with other people. 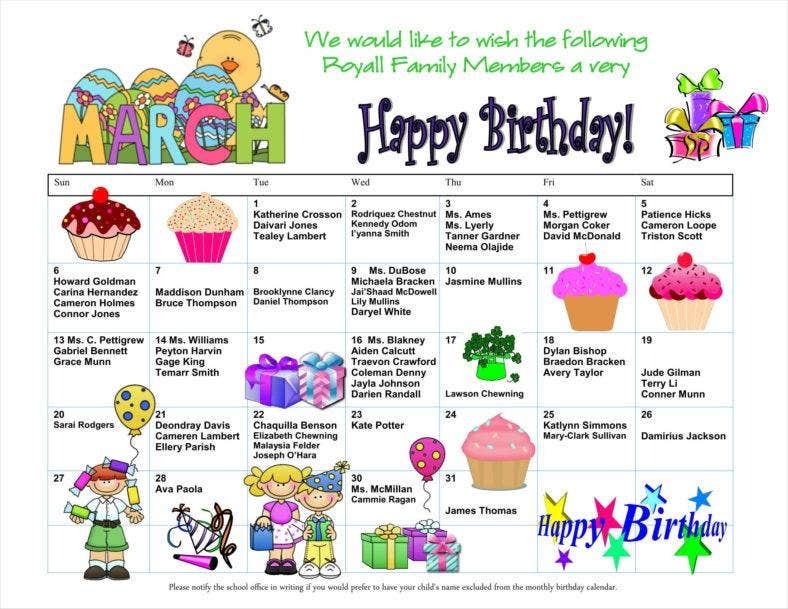 In any case, having your birthday calendars printed out is as valid a choice as any other, and so, is one you ought to consider. While calendar templates can make for invaluable tools, you would naturally have to fill in the specific details on your own. Part of doing so requires that you have all the necessary components to fill out the particulars of your personal birthday calendar. 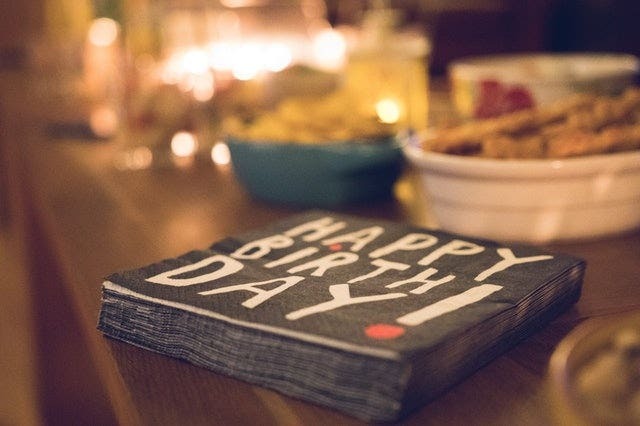 As with other specialized calendars, there are some things that definitely need to be present in your birthday calendars in order for them to do their jobs. It goes without saying that any examples of birthday calendars need to have a list of dates for specific birthdays. As such, you should at least have such a basic list in order to be able to include all the birthdays that you would want to celebrate. Of course, a calendar would be able to do more for you than just provide a basic list, being that it can associate actual persons’ birthdays with their respective dates. A calendar is also able to serve as a reminder for the dates themselves, as well as organize the dates systematically. But there is no denying that the list of dates is one major component of any calendar. When making your own personal calendar, it would be best to make sure you secure a calendar template for yourself. There are several reasons for doing so, primarily that you can save yourself time by using a pre-made template format around which you can build your calendar. The best calendar templates allow you to simply fill in the blanks, so to speak, which allows you to focus on the calendar’s content and leave the basic task of making the format to others. One other good reason to rely on templates is that they are naturally reusable. 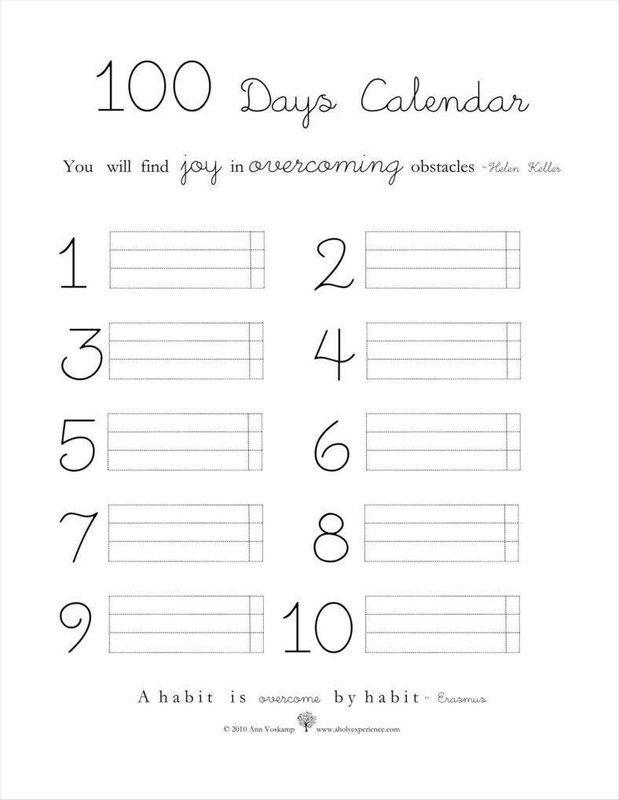 This allows you to recycle templates for succeeding years, allowing you to make new calendars as needed. This also offers options for sharing your templates and calendars with others or customizing them to suit particular occasions. Like most other documents, it is possible to make your documents according to a specific theme. In fact, you may find templates like Microsoft calendars that can provide you with templates that feature specific themes by default. Of course, being that you are making birthday calendars, you can find templates featuring related themes fairly easily so that you can have an easier time making calendars that fit that particular occasion. Of course, you may also design your theme on your own, which can offer you with more options as you may be able to design more particular themes to suit your own history. This can serve as another means of personalizing your calendars to make them more meaningful for you. Birthday calendars are particularly notable for giving you the option of adding images to them. After all, being that these calendars are associated with specific peoples’ birthdays, you could make the calendars more personal by including images of the people in question. This can also serve to contribute to the festive spirit you are aiming for, as you can put a face on the celebration as a whole. Naturally, there are editable calendar templates that can let you add whatever images you like, which also includes the choice of adding and editing images as you please. So if you were very set on having your calendar’s design set exactly how you want it, then this would be a factor you should keep in mind. 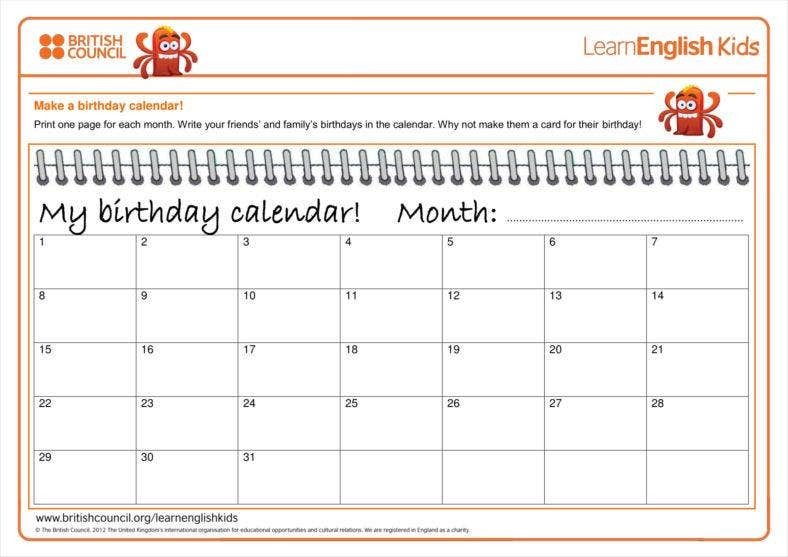 Hopefully, these tips and insights should give you a good idea of how to make your birthday calendars. 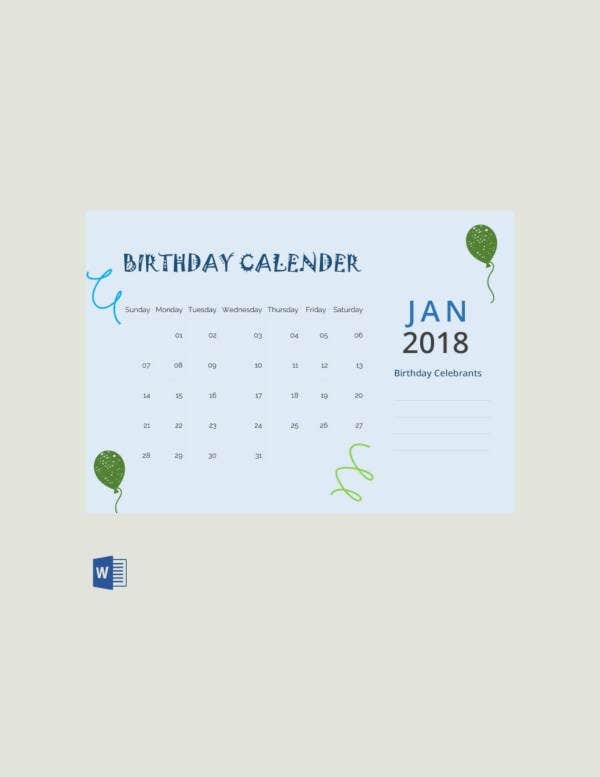 Birthday calendars are a particularly flexible type in terms of design and format, so it would be unsurprising if you were to use a template to help you with the task of making yours.